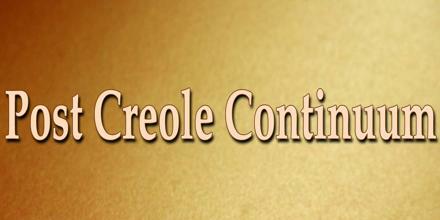 Post Creole Continuum represents the range of dialectal variations found in many creole-speaking communities. It also known as the creole continuum. It was coined by linguist David DeCamp, “Toward a Generative Analysis of a Post-Creole Speech Continuum” in Pidginization and Creolization of Languages, in 1971. Due to social, political, and economic factors, a creole language can decreolize towards one of the languages from which it is descended, aligning its morphology, phonology, and syntax to the local standard of the dominant language but to different degrees depending on a speaker’s status.